Our smile is one of our most important assets. It is like our card of presentation when we are introduced to people and can say a lot about ourselves. Just by looking a person’s smile you can tell if it someone healthy, organized, caring and so on. That is why we have the obligation to take care of our teeth to prevent da y lose color or in the worst case scenario, lose them forever. One of the most common problem our smile faces is discoloration. Our smile stop being white and pearly to became a yellowish mess. One of the effects stained teeth causes is that our confidence drops a bit, because we become self-aware of our little defects. But you don’t have to over think ir and mourn. Everything has a solution and today we are going to teach you how to prevent and stop teeth discoloration. To prevent teeth discoloration first of all we have to take in mind what causes it. And there are many factors that can be the reason that our teeth lose color and get stained. The most common one is a lack of proper dental hygiene. If you don’t brush your teeth at least two times a day the chances are that your teeth will end up pretty stained. Another reason to have stained teeth is your diet. Consuming a lot of sugar and artificial foods with colorants and such can stain your smile pretty badly. The same goes with alcohol, beers and wines can cause disaster in your mouth’s health, especially if you don’t brush and rinse after a night drinking and partying. But the worst thing you can do to your smile is to smoke cigarettes. Tobacco and cigarettes in all their presentation ruin a lot of teeth every year. Abusing these products not only helps to decay your teeth, it also affects your health. Smoking too much can be the cause of cancer, so if you value your teeth and life, please stop smoking as soon as possible. Coffee is a huge teeth stainer too. 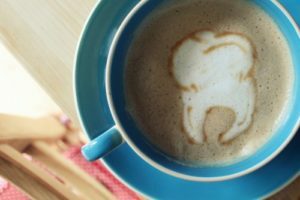 I know coffee can be delicious and a magic elixir to wake up in the mornings, but drinking too much ruin your teeth too. According to several studies, drinking more than one cup of coffee a day can be bad for your teeth. To stop this condition just stop doing the things we list above. If you keep eating bad, smoking, drinking too much sodas and coffee your teeth are going to get worst overtime. To have a healthy body you need to live a healthy life. Make sure you give up some pleasures to keep your teeth nice and healthy. If you want that perfect smile it is a wise idea to make some cuts here and there. Another trick to stop teeth discoloration is to have a proper dental hygiene routine. Brush two times a day, following with flossing and mouthwash to get rid of food debris and colorants off your teeth. But always remember o be very gentle with your brushing because you can destroy the enamel of the tooth and leave your teeth defenseless against bacteria, plaque, and stains, of course. Finally, if you want to solve stained teeth go to your dentist. He or she will know what to do and can help you with cleaning or whitening to get your precious smile back. Avoid using whitening products found in stores and pharmacies, especially if they don’t have de ADA seal of approval. Many of these over the counter products can be very abrasive with your teeth, so be careful! Want a deep cleaning or teeth whitening at low cost compared to the US? Come to Dental Solutions Los Algodones and we will gladly take care of your smile!